Ok so I saw this funny post on Facebook about what a baby really wants for Christmas, and it is pretty spot on, although my list is a little more safe (and totes adorbs). This sweatshirt would be a little big for Everett this year but I love this Etsy shop so much, I just might have to get this for Everett-plus-we're practically French so this is perfect! This elephant chair picture is from Restoration Hardware ($89) but there is a nearly identical one at Costco for only $17.99-Costco FTW. I wanted to start a tradition of getting a Christmas book every year, for the last three years Ben has gotten me one, but this year we get to start getting them for the babes-The Polar Express will be the perfect first one! Also these plaid pants?! We literally could all be in a matching black plaid Christmas card (see last two posts). That corduroy elephant is named Roy and I have been wanting him for Everett since before he was born. Jellycat stuffed animals are the softest most beautifully made stuffies; I want to live in them. I grew up playing with those foam blocks and I will probably enjoy playing with them again more than E. These Mixmates recently had a kick starter campaign and they went above and beyond their goal and I think they are so clever, so cute and they are a local company! 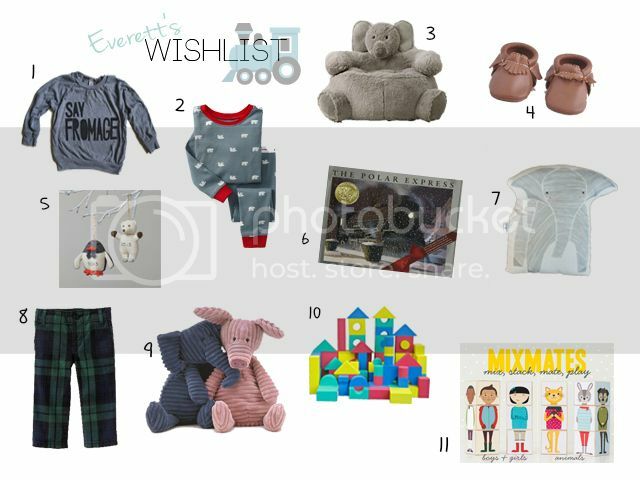 See My Wishlist and Ben's wishlist.